Maybe it’s the because it’s in the bleak final stretch of winter, or perhaps it’s because Super Bowl Sunday may as well be a national holiday. Either way, most of us put away enough calories to rival Thanksgiving watching the big game. 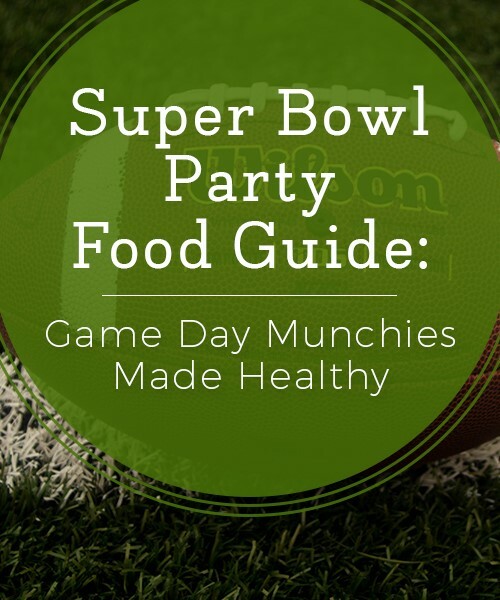 From hot wings and Doritos and all kinds of seven-layer abominations, the food served at your run of the mill Super Bowl party has the potential to nip any diet-related New Year’s resolutions in the bud — you didn’t even get a chance! Well, fear not, healthy sports fan. There’s hope for you yet. Whether you’re a die-hard football fan or just a fan of food, we’ve gathered some healthy Super Bowl recipes that are sure to delight, no matter how many touchdowns your team scores. The ultimate super bowl party food, you can’t have a game day gathering without inviting the chips and dip. Unfortunately, the usual lineup of nachos, creamy dips and chips galore isn’t exactly filling or waistline friendly. Luckily, we’ve got a couple easy options that are a bit healthier than your average calorie bomb. A note about dips — sometimes dips get a bad rap because they are combined with their partner in crime, salty, fatty chips. If you’re concerned about keeping things on the healthy side for your Super Bowl party, opt for baked chips with minimal processing — organic corn chips or veggie chips. You can serve more than chips — it’s also a good plan to offer some cut up veggies for mindless snacking. This super bowl classic gets a bit of a facelift. The flavor is largely what you’d expect from a guacamole — creamy, fresh, chock full of tomato and avocado. But there’s a few extra greens to keep things feeling light. Serve with classic tortilla chips, a vegetable platter or both — you decide. In a large bowl, mash the avocados with lemon juice until fully blended. Add chopped cilantro, bell pepper, spinach, onion, garlic tomato and jalapeno. Stir thoroughly and place in the fridge. Allow the dip to rest for about an hour before serving to bring out the flavors. Transfer to a serving bowl when cooled and serve alongside chips, veggies or use as a topping for other dishes. Eat your greens, with a side of creamy. Greek yogurt offers a bit of protein, without adding a bunch of extra calories. This spinach kale dip is the perfect way to get your daily dose of fresh veggies with a little kick. Serve alongside a crudité plate or with some baked chips. Heat olive oil in a large skillet over medium high. Add onions and garlic and sauté for about 3-5 minutes, or until mixture becomes fragrant. Add greens, stirring in, and cook until the mixture becomes tender and wilted. Remove from heat, and add the greens into a food processor. Pulse until pureed, and then add the Greek yogurt, ricotta cheese and lemon juice. Remove the mixture from the food processor, and then transfer to serving bowl. Top with black and cayenne peppers. Serve with veggies or chips. While Super Bowl parties don’t exactly require the preparation of a multicourse meal, you’ll want to keep guests well-fed with some “real food.” Sure, this whole set up may scream pizza, beer and all things buffalo, but we have a few ideas that are both good and good for you. These mini burgers are the perfect bite-size treat — who doesn’t love sliders, after all? Low-fat turkey burgers topped with a zesty black bean spread, rather than fatty mayo, topped with a little tomato and onion make for a winning combination. Make black bean spread first. Combine all ingredients in a food processor, pulsing until ingredients are thoroughly blended. Transfer dip to a serving bowl and store in the fridge while preparing the burgers. Next, combine turkey, salt, pepper, and garlic in a large bowl. Mix thoroughly until turkey is seasoned. Divide the meat mixture into 12 equal parts, patting into quarter-inch patties. Coat a large skillet with non-stick cooking spray, heating pan over medium-high. Add patties and cook 2-3 minutes on each side, or until cooked all the way through. Repeat until all patties are cooked. Set aside. Slice rolls in half. Assemble sliders — 1 patty, slice of tomato, slice of onion. On top half of bun, spread a generous amount of black bean dip. Repeat. Transfer to serving dish and enjoy. You’ll have some black bean dip leftover; feel free to serve or save for a tasty snack for later. Forget that soggy delivery pie. This easy-to-make pizza takes the football-watching staple to a much better place. Topped with savory sausage and mushroom and little fresh mozzarella, this is sure to win over hungry guests. Pre-heat oven to 450 degrees. Stretch the dough over a large baking sheet and brush with oil. In a large skillet, heat remaining oil on medium high. Add mushrooms, onions, and sauté until onions appear translucent. Spoon tomato sauce over the dough, and spread evenly. Slice fresh mozzarella into medallion shapes and layer over the sauce. Top with sautéed mushrooms and onions, and chicken sausage. Add pizza to the oven and bake for 15-20 minutes, or until crust is golden brown. Remove from heat, and sprinkle with fresh basil. Drizzle balsamic vinegar over the top and serve. Every party needs some kind of crispy snack. These coconut shrimp are a bit healthier than the usual fried shrimp dish, forgoing the bleached white flour in flavor of a more coconut-y approach. They’re great alongside veggies, salsas or spicy sauces — these babies are versatile. Combine flour, coconut flakes, black and red pepper in a medium mixing bowl. Salt the shrimp to taste, then coat in dry mixture. Coat shrimp with eggs and add shrimp to the skillet. Cook until the coating is crispy and golden brown. Serve with salsa or chili sauce, if desired. Bite-sized toasts with a creamy white bean topping, these crostini are as healthy as they are addictive. Mix and match with different toppings — veggies, herbs, smoked salmon, you get the idea and have fun, these are hard to mess up. In a food processor, puree the cannellini beans with olive oil and garlic and half of the lemon juice. Lay the sliced bread on a large baking sheet. Coat lightly with olive oil and toast for 10 minutes or until they become golden brown and slightly crispy. Remove bread from the heat. Spread white bean mixture generously over each slice. Top with flax seeds and cilantro, and then drizzle the remaining lemon over the crostini. Kale chips, contrary to popular belief, are actually delicious, and somewhat overpriced when you purchase them pre-made. While these typically require a bit of time to allow for dehydration, we’ve cut the time down to 30 minutes from raw to ready. With a little turmeric, garlic and cayenne pepper, you’ll get a full serving of greens with a hearty kick to go with it. Serve in a big bowl, and these veggie chips are sure to be gone in short order. In a large mixing bowl, add kale and olive oil, massaging the greens so they become soft. Add cashews, yeast, turmeric, salt, pepper and garlic powder to a food processor or blender, pulsing until the mixture turns into a fine powder. Add the dry mixture to the kale, tossing with hands until fully covered in spice mixture. Spread kale over a large baking sheet — this may require more than one batch depending on the size of the sheets. Bake kale for 20 minutes, or until kale becomes browned and crispy. If needed, bake for an additional 5 minutes. Super Bowl watchers expect to indulge their inner sweet tooth on this special day. Whether it’s the anxiety of watching your team make it oh so far, and potentially lose, or the Near-Thanksgiving levels of indulgence, everyone appreciates a good dessert to go with their football. Here’s a few lighter sweets that will have everyone clamoring for more. Part pie, part granola bar, these easy-to-make bars are a tasty, bite-size treat that tastes a bit more indulgent than it actually is. With coconut sugar, granola and tons of berries, we think it’s a winner. Preheat the oven to 375 degrees. Meanwhile, grease an 8” baking dish with butter or non-stick cooking spray. In a large mixing bowl, combine the coconut sugar, flour, baking soda and granola. Melt butter slightly and use hands to fold into the dry mixture. Add 2 ½ cups to the bottom of the baking dish, then add the fruit over the top. Add remaining dry mixture over the top of the fruit. Place in the oven for 40 minutes, cooking until the edges appear golden brown. Let dish cool completely before cutting and serving. We know we’re staying on the wagon this Super Bowl Sunday, but a game day party just wouldn’t be the same without a hint of chocolate. We took the idea of the perennial favorite, the peanut butter cup, and made it a touch healthier with these bite-size treats. First, line a baking tray (or dish that fits comfortably in your freezer) with parchment paper. In a large mixing bowl, add almond butter and honey, mixing until fully blended and thickened. Add the coconut flour, and fold in to firm the center. Shape the mixture into small ball shapes and set aside. Meanwhile, in a small pot, melt the chocolate chips and the oil over low heat. Stir until smooth and remove from heat. Using a fork or skewer, dip almond butterball into the melted chocolate, ensuring that each piece is covered generously. Lay each piece on the covered baking sheet and place in the freezer until the chocolate sets. This should take about 20 minutes. Get Cooking for Game Day! In the market for a Dutch oven, that cooks the perfect pot of chili, or some serving plates for the big game. At Ceramcor, we’ve got it all. Between our Xtrema cookware and our Ovenex bakeware and Fridgex storage containers we’ve got the tools you need for healthy cooking, whether you’re cooking for a whole football team or just a couple friends.